Two new projects involving two different polychaete groups made an excellent opportunity to do field work. January may not be the best time of year, but that was the opportunity we got. Sphaerodoridae and owenids were target groups, unfortunately with almost no result. NTNU’s research vessel “Gunnerus” is busy, so booking time after the dead line only gave one day in January as possibility to look for worms. Although the temperature was low, -10 °C, the weather was nice, giving good working conditions. 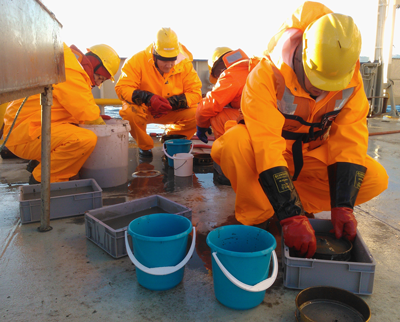 Sampling with an epibenthic dredge should produce good samples of sphaeodorids, which is the experience from offshore. Obviously not so in the Trondheimsfjord. The target was the deep part of the fjord and we did two hauls at about 500 m depth. We used both 0.5 mm and 0.2 mm sieves so that we should not miss any tiny specimens, with no luck. No sphaerodorids and only two oweniids. Although no success finding what we especially were after, we got good samples of other polychaetes. This will be valuable towards a goal to get DNA barcodes of polychaete species from Norwegian waters.